Six-year-old Archie Aspin was just two weeks old when his mother brought him to his sisters’ ballet class for the first time. It was then that Amanda Aspin realized ballet might be as beneficial to her son’s development as it had been for her daughters’, and perhaps even more so. 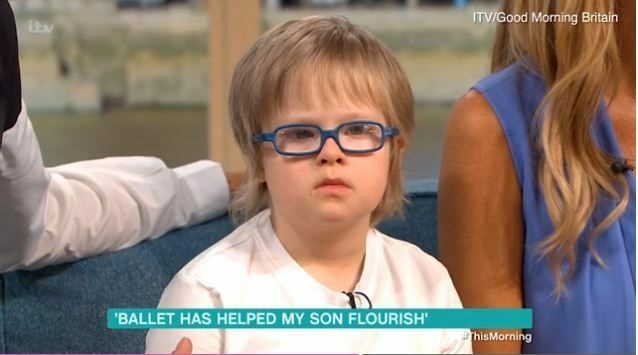 Archie was diagnosed at birth with Down syndrome. Told that her son likely wouldn’t walk until he was three or four and his social and motor skills would be affected, Aspin and her husband were motivated to help their son grow up to be as independent as possible. They know that he has more potential than the world might see, and they want him to fully reach it. What Archie would do next would impress everyone with the social skills they weren’t sure he would have. His mother says he shows no fear in approaching new children to play with and attends a mainstream school where everyone accepts him for who he is. But the class isn’t just benefiting Archie. Research shows that children without disabilities increase their emotional intelligence when they are allowed to socialize with children who have disabilities. It prepares them for adulthood in an inclusive society, helps them master their own knowledge and skills by assisting their differently-abled peers, and allows them the opportunity to understand people who are different from themselves. Archie recently appeared on the British show This Morning where he stole the spotlight and had social media buzzing. He showed off the moves he has learned to the audience and the fans loved it. #ThisMorning such a little sweetie! If only the world was filled with kids like Archie! Knowing they won’t always be around, Archie’s parents want him to be independent so that he won’t have to rely on his older sisters to do everything for him. While siblings of children with special needs like Down syndrome are often eager to step into the role of caregiver, Archie’s parents feel that he will be capable of living on his own someday. Children with Down syndrome are as valuable and full of potential as any other child. Archie is proving just that.